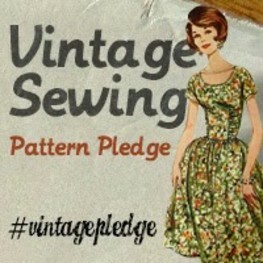 Here's one a sewed about 6 months ago, tapping into my Vintage Vogue collection. 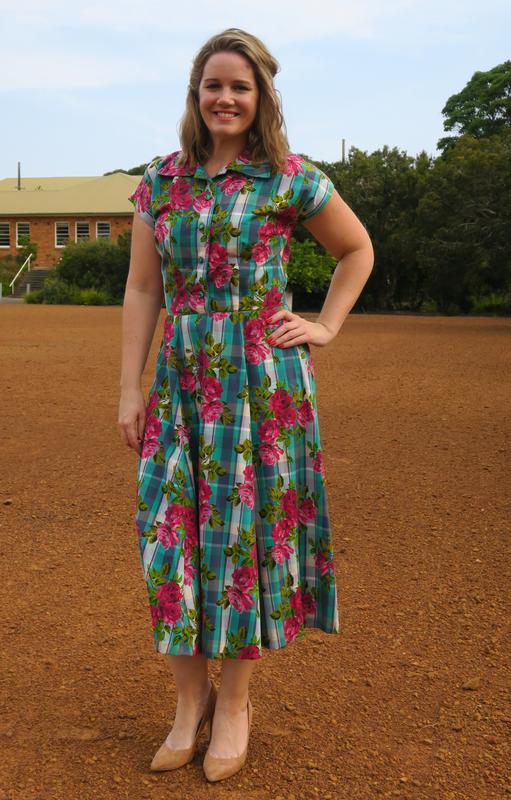 I used Vogue 9000, a pattern from circa 1951. 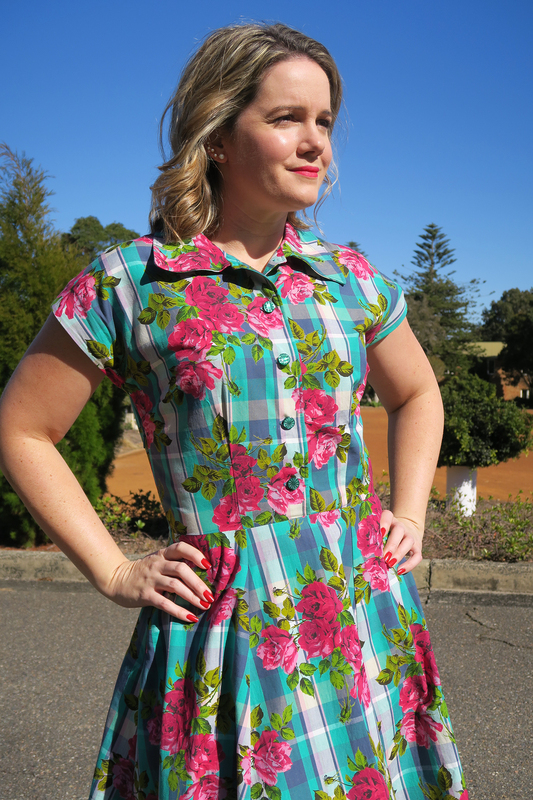 It's a lovely shirt dress with a button down bodice, side zipper, french darts and a flared skirt with gores. It does talk about shoulder pads, but thats something I've never really bothered with. I worry too much that I'd end up looking like a NFL player. I cut it out in a straight size 12 and kept the length to the skirt as per the pattern. 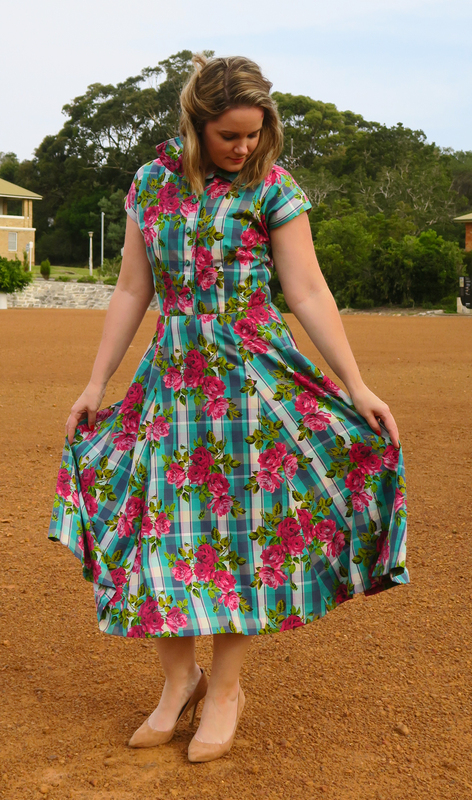 For this dress I cut into a Liberty madras check fabric I picked up from The Fabric Store. 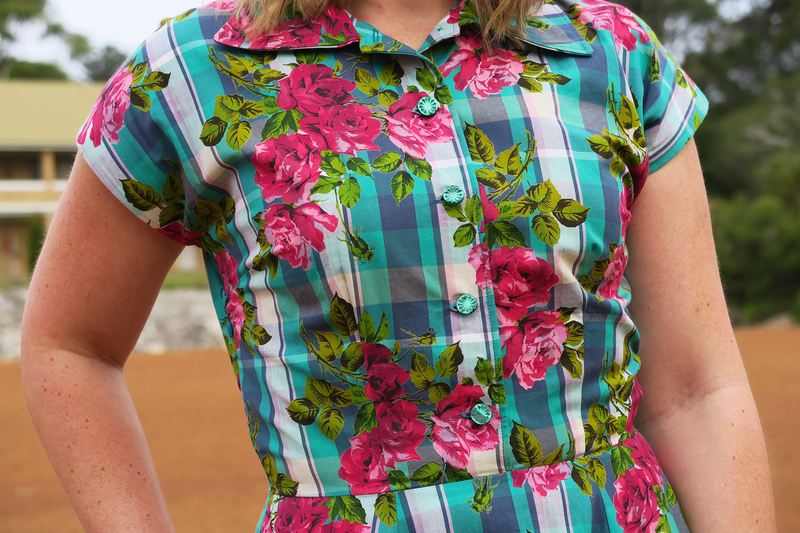 I just loved the green and pink combo and it was a joy to sew with. I expect nothing less when it comes to Liberty fabric. It is a cotton with a bit more drape to it than the Liberty tana lawn. When I cut it out I paid attention to the plaid pattern on the fabric and tried to line up the squares as best I could, and I also lay the pattern pieces in the same direction. The construction of this dress was pretty straght forward until it gets to the collar. It took a couple of goes and some re-reading of the instructions to figure out how to nail the collar and have it symmetrical and laying correctly. Thankfully with a little persistence I got there in the end. 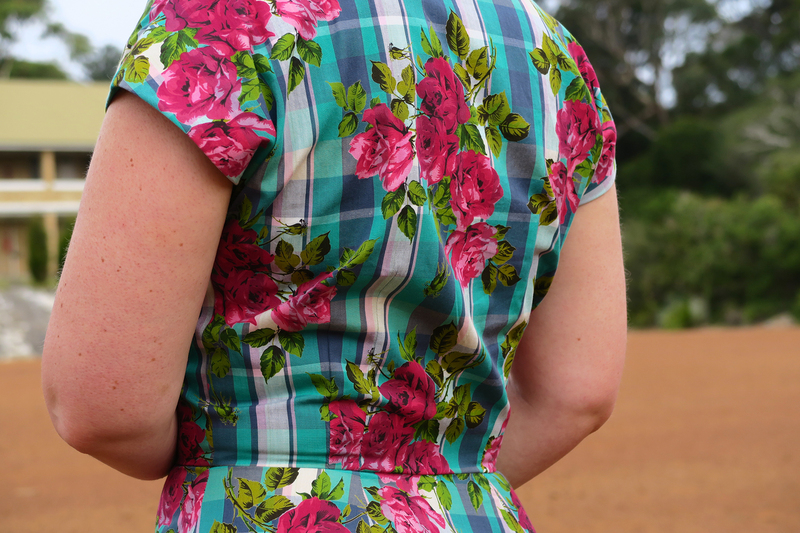 I was worried that the bodice would be too big, but as it came together I actually liked the looser fit on the bodice compared to the usual 1950's fit. 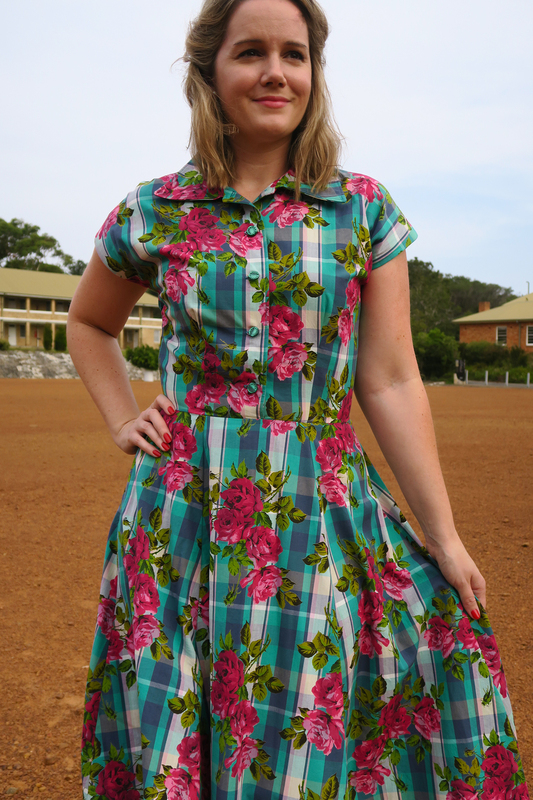 It still has a fitted waist to maintain the 50's silhouette and then flares out nicely from the hips. The sleeves are finished with facings, and whilst I tacked them down on the side and shoulder seams they do have a habit of turning out when I put the dress on, so they may need to be tacked down a bit more on the back. I also opted to use an invisible zipper on the side seam instead of a lapped zipper because I find them easier to insert, and it gives a smoother finish than my efforts with a regular zipper. The waistline on this pattern is a little lower on me than other Vintage Vogue patterns I've made. 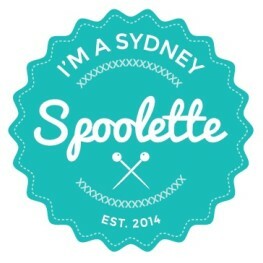 It feels about 1.5cm lower than where it would sit normally, but it didn't bother me enough to adjust. If you are short waisted I would be mindful of this. 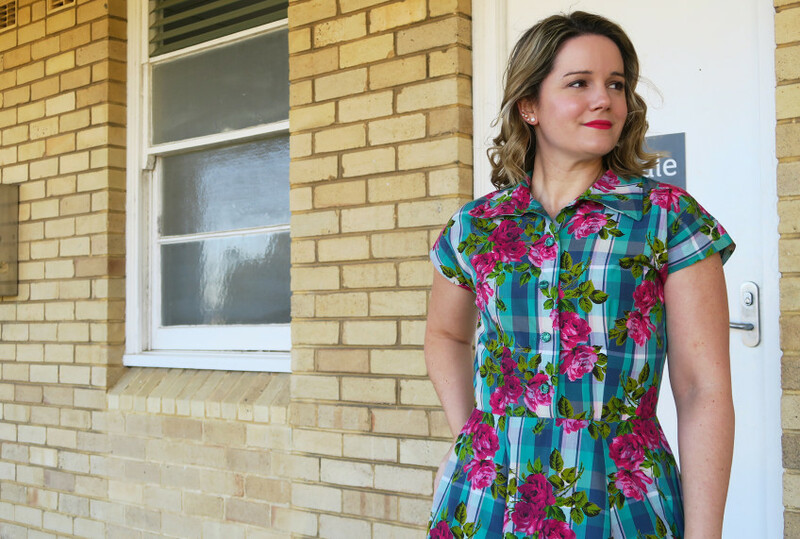 It's another cracking Vintage Vogue pattern, and it has been a great dress to wear to work! Wow that dress is a cracker. It looks fabulous on you. I love it. And yes there is no fabric like Liberty fabric. I was so tempted to buy that fabric from the Fabric Store. I should have, it looks so great on you. Forgive me but is that North Head?